In the early 1960s Portugal engaged in what was later known as the Portuguese Colonial War ("Guerra do Ultramar" in Portugal) that lasted till 1974 on fronts in Angola, Mozambique and Portuguese Guinea. Portuguese AF (FAP) detached to the theatre a variety of aircraft, including T-6G/Harvard Mk IV, B-26B Invader, F-84G Thunderjet, F-86F Sabre, Fiat G.91, Nord Noratlas, Dornier Do-27, Alouette II & III and SA-330 Puma helicopters. All wearing either respective standard peace-time painting schemes or temporary war-time camouflage of "anti-radiation green" (colour similar to FS34079). 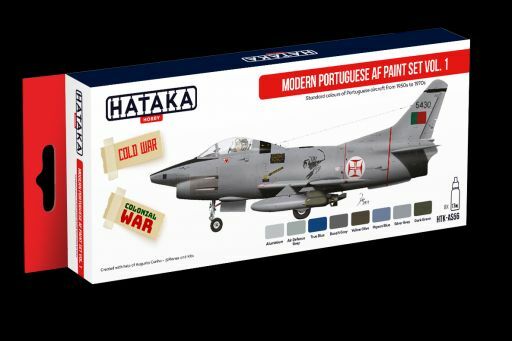 HTK-A220 - True Blue FS15102, initially used for high-visibility identification of F-86F Sabre of Esquadra 51 "Falcões", after 1968/69 used on all F-86Fs of FAP.